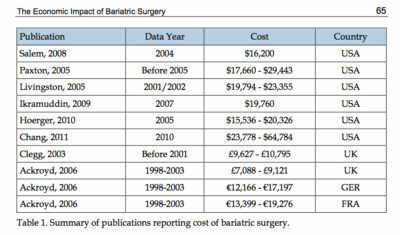 Return of Investment for Bariatric Surgery – weighing in the options for good returns. How much are we willing to pay for an improvement in health? What if the initial “investment” put into surgery allows an actual return within several years, given the improvements in health and the consequent reduced treatment involved? The benefits of weight loss have been well-documented, and those having gone through bariatric surgery having a lower long-term mortality, less medical problems (better control of diabetes, hypertension, hyperlipidaemia and obstructive sleep apnoea), less need for follow-up medical consultations and medications. As a result of these benefits, better employability has been demonstrated for job applicants of a lower BMI. Taking into consideration the initial cost of bariatric surgery, papers have been written about the potential return-of-investment with a lower utilisation of health-care resources and medications. In some of these analyses, the time to re-coup these “losses” can be as fast as 2 years. Intuitively, as a large part of the potential savings comes from reduced co-morbidities, this reduction is most dramatically seen in those with type 2 diabetes. Previous article A Cure for Diabetes?